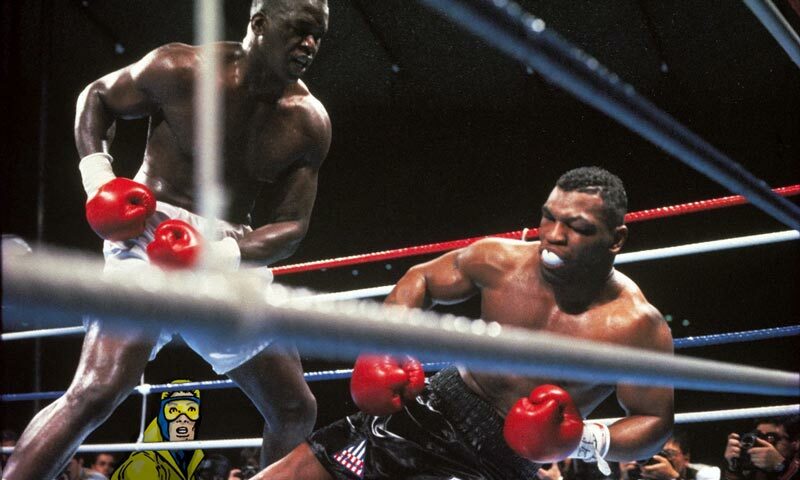 It might be hard for modern audiences to imagine, but in the late 1980s, "Iron" Mike Tyson was considered invincible. He had never lost a fight. His bouts averaged barely more than 3 rounds. He usually had his opponent knocked out before the end of the first round. Then came Buster Douglas. Douglas was a heavy underdog when the two heavyweight boxers met on February 11, 1990. Casino oddsmakers had Tyson a 42/1 favorite, meaning a $42 bet earned only $1. However, if Douglas was to pull off the upset, a $1,000 bet on Douglas would pay out $37,000. Too bad that could never happen. It's been said that the unexpected and improbable Douglas victory was the biggest payout for a boxing match in history, making it a perfectly safe bet for a time-traveling sports fan looking to make a quick buck. Someone like Booster Gold. Hmm. A sports gambler using time-travel to his own advantage? Someone should make a movie about that. If you had six Booster Gold autographs and Booster gave you eight more, how many autographs do you have? If Booster Gold had ten costumes and Doomsday destroyed two of them, how many costumes remain?